an important place of our resistance is to be destroyed. In the last few days, it seemed that the ongoing of Hambi occupation was only a matter of a few days. We do not want to let that happen! 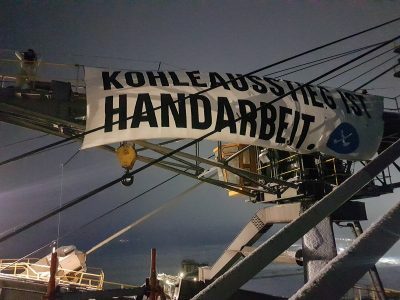 We, Ende-Gelände, call for two actions: now on 6 Ocotber and of course from 25 to 29 October, to the long planned big mass action. A few days ago the invitation to our action at the beginning of October reached you. 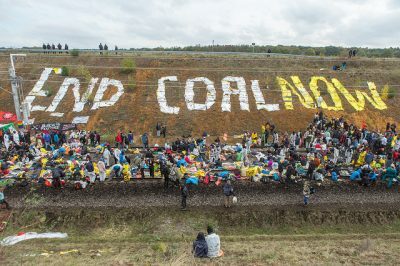 Stop coal now! Hambi stays! for all who are already there, are on Friday at 7 pm and on Saturday at 9:30 am in the Hambi-Camp in Manheim. For the action on 6 October several Ende Gelände local groups and multiple befriended groups have united. Due to limited planning time your self-organization is inevitable. They should arrive on Friday or Saturday morning and not return before Sunday. 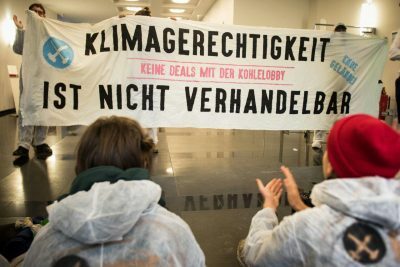 Like this, you will have more time to settle in before the action and you can also join the protests on Sunday to maintain the AZ (autonomous centre) in cologne. Inform your groups in the buses about legal issues, the action consensus, affinity groups (see below). And please make sure to report buses that are available on site to the action logistics! 2) Or check if there is an NGO bus from your city. Please make sure the bus will not return before evening. If it leaves right after the NGO demonstration, you will need an overnight stay on site! 1) If possible, please try to stay with friends in the area. 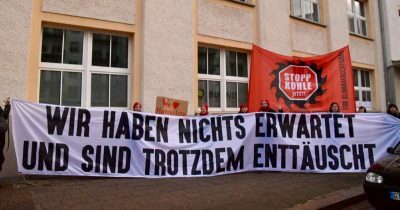 2) Hambi-Camp: A limited number of activists can stay at the camp site in Manheim. But please keep in mind that the camp does not work automatically! Especially in the days before and after thousands of people are on the site the camp is happy to be revitalized and to find many helping hands. So please think about how long you want to stay. 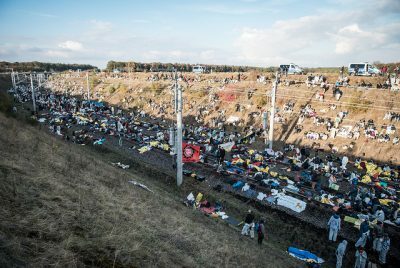 Also for the Ende Gelände action on 6 October there will be an “Out of Action” offer: activists who want to leave the action due to very stressful experiences, will find people to talk to there. If a person from your affinity group is leaving the action in order to take good care of her- / himself – please make sure that somebody accompanies them! Out of Action Cologne will be on site the whole weekend from 5 to 7 October at least in the AZ Cologne and is reachable via mobile under +49177 69 57 448. For the action you will need: Hammock, sturdy shoes, warm clothes, dense universal cloth, rain cover, food, enough water, identification papers (if you want to identify yourself), a little change, small first aid kit, gold foil life blanket and medication if needed. Make sure your luggage does not get too heavy. What you should leave at home: unnecessary information about you (calendars, private phones), anything that can be interpreted as a weapon, alcohol/drugs, cameras. No creams, make-up, contact lenses (because of pepper spray). The most important mobilization for the 6 October will be happening on social media. Please join in and share with many! Organize a mobilization action in your city, inform other people about Ende Gelände or share your best Hambi experiences. Our usual Ende Gelände outfit will not be available this time. So choose your own outfit for the day and show our theme on your winter jacket or overshirt. 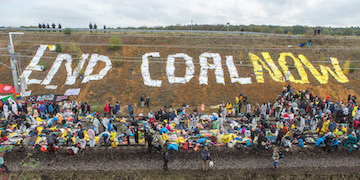 Our goal – end coal! 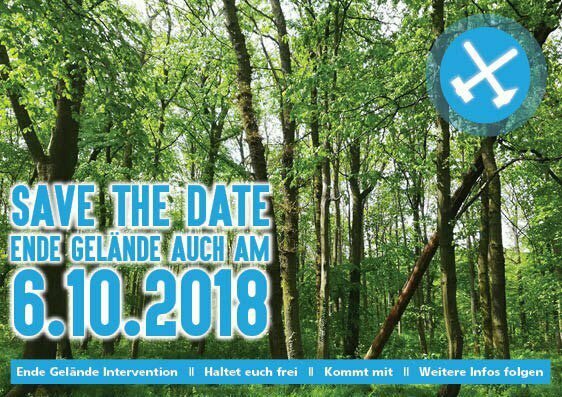 See you on 6 October at the Hambacher Forest!